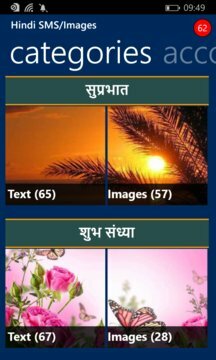 Hindi SMS/Images app is a collection of Hindi SMS/Images text messages and Images in Hindi font (3000+). We provide a simple & elegant way to save your favourite text messages/Images and share them with rest of the world through SMS, Email, Facebook, Twitter, Whatsapp, Hike and more. It comes with an inbuilt Hindi typing feature so the user can type SMS in Hindi and upload to us under your name. You can receive new SMS/images automatically on daily basis. No need to update the app. * Inbuilt Hindi typing keyboard. * Add messages/images to favourites list. 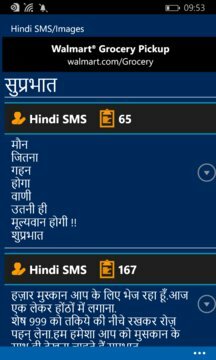 * Post messages/images on “Hindi SMS/Images” app along with your name.